In yet another in a two-year series of interesting and important news reports on developments in e-fulfillment, the Wall Street Journal broke a story last week on a partnership between Amazon.com and Procter & Gamble, in which Amazon locates mini-fulfillment centers inside P&G DCs. The arrangement apparently started some three years ago, but is just now is coming to light. From the first arrangement, believed to have been in a P&G DC in Tunkhannock, PA, the consumer products and e-commerce giants have expanded the program, the Wall Street Journal reports. 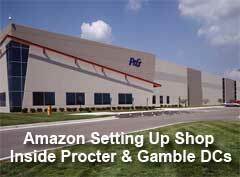 Amazon is now inside at least seven P&G distribution centers world-wide, including locations in Japan and Germany. A well-known food company put receiving doors next to shipping doors. That way, a driver bringing a pallet to the shipping staging area could pick up a putaway pallet right next door. The potential benefits are obvious. By shipping directly from P&G facilities, Amazon cuts out the shipment leg normally executed to move product from the manufacturer's distribution center to an Amazon fulfillment center. Receiving costs are surely lower too, with a simple transfer inside the DC of pallets of goods on fork trucks into the Amazon area, versus unloading trucks and putting the items into storage in the traditional DC flow. Order picking processes in the embedded fulfillment centers are probably pretty simple too. But there is a potential downside, it would seem. If a customer orders products other than those from P&G and carried in one of these embedded facilities, Amazon would have to make a second shipment from one of its traditional fulfillment centers, adding to total shipping costs. Of course, Amazon often makes multiple shipments currently on regular merchandise, most notably when some products in an order must be drop-shipped from its vendors. In this regard, Amazon probably has some advantage with the P&G partnership, in the it acquired the Soap.com and Diapers.com web sites a few years ago. Those focused sites likely do get lots of orders say for nothing but P&G's Pampers diapers, reducing the chances a second shipment would need to be made. "I could even see the chance Amazon would provide an financial incentive in some way for ordering only products that could be shipped from one of these embedded DCs," said SCDigest editor Dan Gilmore. In turns out that Amazon has an official program for these embedded fulfillment centers, which it calls Vendor Flex. It is not clear, however, if any manufacturers other than Procter & Gamble are actually participating program currently. However, the Wall Street Journal did say that Amazon is already inside or in talks to enter the warehouses of Seventh Generation, a unit of Kimberly-Clark, and Georgia Pacific. Both companies are fierce P&G rivals. Needless to say, some retailers are not happy with the arrangement, believing it gives rival Amazon a big advantage on-line. Clearly, Amazon's substantial test of its Amazon Fresh same-day grocery offering, is making many traditional brick and mortar retailers nervous. The fear of course is that Amazon may take a meaningful bite out of the traditional grocery sector's HUGE revenue, estimated to be somewhere in the $600 billion level in the US. That has grocer's pursuing their own on-line channels. Walmart, the largest grocer in the US, is testing same day delivery, including groceries, in a number of markets, often using its stores as fulfillment points. One large regional grocery chain says that e-commerce is now its top corporate priority. While on-line buying of household staples such as soap, paper towels, and tooth paste to date have been just a tiny sliver of the total market, the analysts at Nielsen predict the category will grow 25% annually over the next couple of years. The CEO of Seventh Generation, which makes diapers, baby wipes and cleaning products, said more than 20% of the Burlington, Vt., company's sales come via the Internet, up 100% in the last five years. Clorox said its from e-commerce channels will hit $200 million in 2020, up from $75 million in the fiscal year ended in June. P&G's Tunkhannock DC is a "mixing center," carrying most P&G products shipped in from its manufacturing plants so that a retailer can place just one order and have all the items it needs sent in one shipment, with one invoice. The mixing center concept has become quite popular over the past 15-20 years, as the largest players in the consumer products industry have generally moved away from plant-based distribution. This has also led retailers to be able to place more frequent orders for less total inventory, as truck load volumes can be achieved across the whole breadth of a manufacturers items, rather than ordering more than they need of a given product line (say paper products) so they can fill up a trailer to reduce transportation costs per unit. Putting an embedded DC inside a single plant warehouse would probably not make sense, but does so in a mixing center environment. The efulfillment wars continue on. What are your thoughts on this P&G-Amazon approach? Will it work? Will it be the model going forward? Let us know your thoughts at the Feedback button (email) or section below.